On Friday, September 22, over 170 guests in “creative cocktail” attire gathered at The Palladium for Circus Flora’s annual fundraising gala, Flora Dora, raising over $75,000 for the organization’s year-round community outreach programs and special engagements. This year’s theme, “Celebrating the Art of Circus,” provided guests the opportunity to stroll through Circus Flora’s history of Big Top Season posters, such as 1996’s “Ruvna and the Great Exposition of 1904” and, most recently, 2017’s “Time Flies.” This year’s event was co-chaired by Meredith Marine & Dr. Neal Sample and Jeffrey & Stephanie Zornes. Event sponsors included Edward Jones, SSM Health Cardinal Glennon Children’s Hospital, Express Scripts, Inc., and Midwest BankCentre. This was a brand new time of year for the 17-year-old event and a first-time venue; past Flora Dora galas were held during the Big Top season on the circus lot, but no guests of this year’s event missed braving the elements or getting sawdust in their heels, thanks to The Palladium’s fabulous amenities and fantastic performances by America’s Got Talent finalist Christian Stoinev, with Percy, and Santé Fortunato. Fine dining was provided by Butler’s Pantry, a wide variety of items were deftly auctioned by Fox2’s Kevin Steincross and the evening culminated with dancing, with music provided by the talented DJ Nune. The real treat for longtime Circus Flora supporters and new Flora Dora attendees alike was the surprise announcements of the 2018 Big Top Season dates AND show title. Executive Director Larry Mabrey and Artistic Director Jack Marsh were on hand with breaking news that “The Case of the Missing Bellhop” will debut in Circus Flora’s brand new Grand Center location on April 19, 2018! Stay tuned for more information; you will not want to miss this brand-new production, the first in our new, permanent home! Amidst all the glitz, the thrill of a live auction, glittering decorations, and entertainment, the reason for the event was clear, and the true star of the evening was the outreach that happens Beyond the Big Top. Circus Flora’s flagship community outreach program, Clowns on Call, was well-represented at Flora Dora; not only were principle performers Tom Eggers (clown name “Too-Me”) and Audrey Crabtree (clown name “Pepper) on hand to provide strolling entertainment during the cocktail hour, but the evening’s program included a feature recently shown on Fox2 that gave each guest a glimpse of the magic the Clowns on Call bring to thousands of hospitalized children and their families in SSM Health Cardinal Glennon Children’s Hospital. 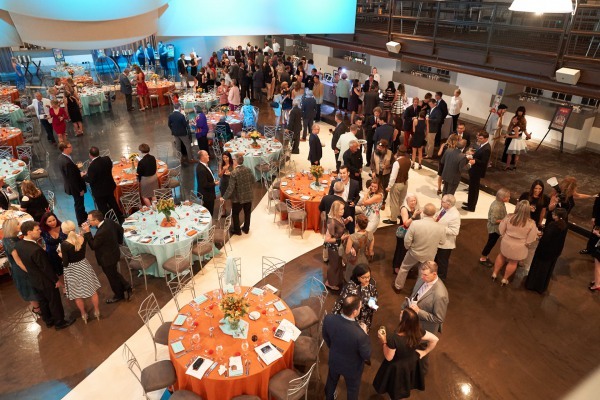 The Flora Dora gala also raised much-needed funds for the Share the Circus ticket donation program, which distributes 3,000 tickets to children and families in underserved communities each year. Circus Flora’s annual “peanut free preview” and “sensory friendly performances” were also supported during the Fund-a-Mission portion of the program. Thank you to all who supported this year’s Flora Dora gala, and please mark your calendars for next year’s event on Friday, September 21, 2018. In the meantime, while this year’s event has passed, the need for your support has not; you can learn more about Circus Flora’s work Beyond the Big Top and consider getting involved with a financial donation.